In my Child’s Play Music early childhood education incursion programs I tell children that they can make music from practically anything that makes a sound – and it’s true! And if you are looking for metal to make your own musical instruments you can’t beat a real old-fashioned ‘scrappie’, a scrap yard piled high with with all sort of interesting metal bits carefully sorted by type of metal. I design my instruments to be simple, safe and tough, because I work with very young children in all kinds of early childhood education and care settings here in Perth. Wherever possible I use recycled materials; I get a real kick out of upcycling scrap metal to make great sounding instruments that children love to play, and I love to spread that message of sustainability. Stainless steel cymbals – CRASH! The best scrappie in Perth, WA! First, find your scrap yard! Most big scrap yards crush their metal as soon as it arrives into big cubes of mangled metal. So you want the old-style scrap yard that sorts and stores metal before crushing it and will sell it to the public by the kilo. Often these are smaller, family-owned yards rather than the big chains. You can still find them in most cities, tucked away in obscure places. 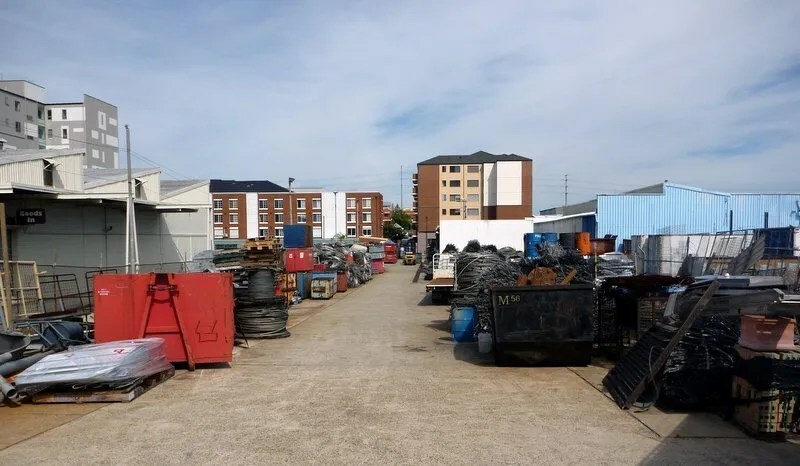 Some of the big chains also sell scrap to the public but they tend to have a limited range, mainly of structural steel and pipe, and this is less useful for instruments. 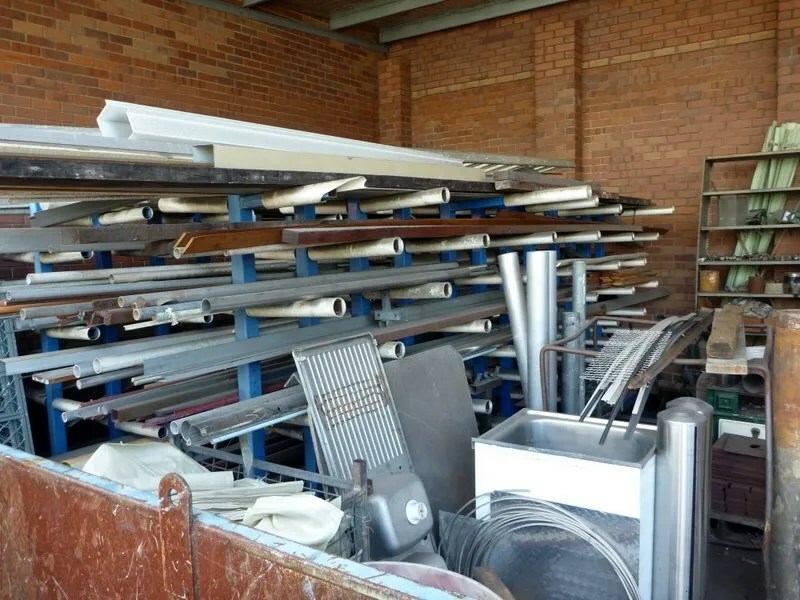 To find a scrappie, in Australia search “scrap metal merchant” in the online Yellow Pages. Check out their websites – some will say they sell to the public, but even if they don’t say so they may still do it. 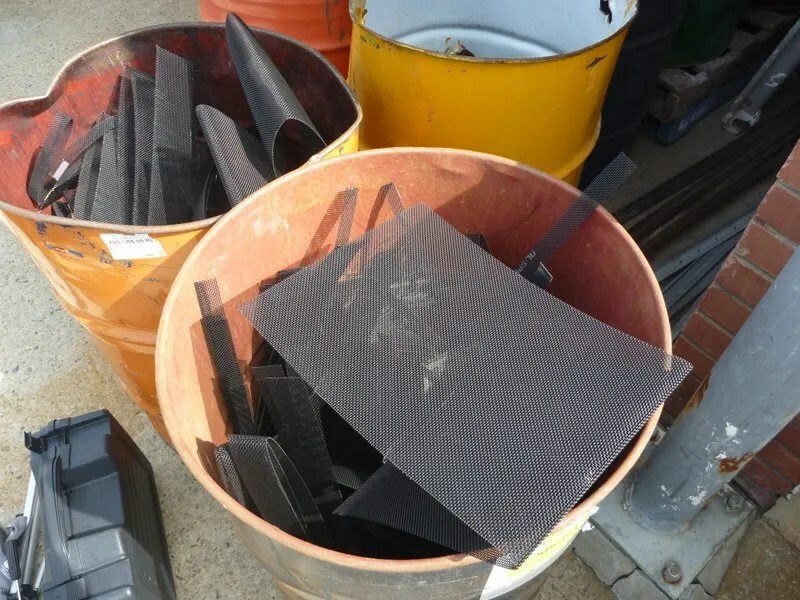 If there are images of piles or bins of un-crushed metal it’s pretty likely they will sell it. If there are only images of cubes of crushed metal, it’s a pretty good indication that they aren’t selling to the public. Rondas & Co – scrap metal heaven! This is Rondas and Co, at 134 Fitzgerald St, North Perth, and it’s a treasure trove of junk. Many of my instruments are made from metal bought there, and I’ve spent hours happily fossicking through bins looking for just the right bit for my next scrap yard musical extravaganza. No website: just great scrap metal, cheap. For detailed information about actually making instruments you can’t go past the books by Bart Hopkin – check my review of three of Bart Hopkin’s books here. Steel, aluminium and copper pipe – or old sink units! Those pipes can be ideal for glockenspiels, wind chimes or even tubular bells, and each type of metal has its own characteristic sound. Steel tends to be bright and clear-sounding, but it’s hard to work with and heavy, and if it’s thick-walled industrial pipe in mild steel, forget it – it will be have very little resonance and sound very ordinary indeed. Look for thin-walled stainless steel or other hard alloys of steel instead. But mild steel rods can sound good – try them to see! Aluminium is less bright but sustains well even with relatively thick walls. It’s much easier to cut and much lighter than steel too – I use more aluminium for my instruments than any other metal. Copper piping is also easier to work than steel, and tends to sound halfway between steel and aluminium in tone. Check inside the pipe – a lot of copper pipe is from old water systems ripped out of demolished houses, and if it is furred up inside with calcium deposits it won’t sound good at all. But perhaps you are after the crash of cymbals or something for a flat metal glockenspiel: voila! Stainless steel sheet – hard to work with, but it can sound great! That square of 1mm stainless steel on the left – round the corners off with an angle grinder, drill a hole in the centre, bend an ‘X’ crimp from corner to corner: instant crash cymbal! And the 2mm sheet on the right could work well as narrow strips for a glockenspiel, or possibly as a suspended gong. Aluminium sheet of all kinds! But stainless steel is hard to work with: how about some aluminium sheet instead? 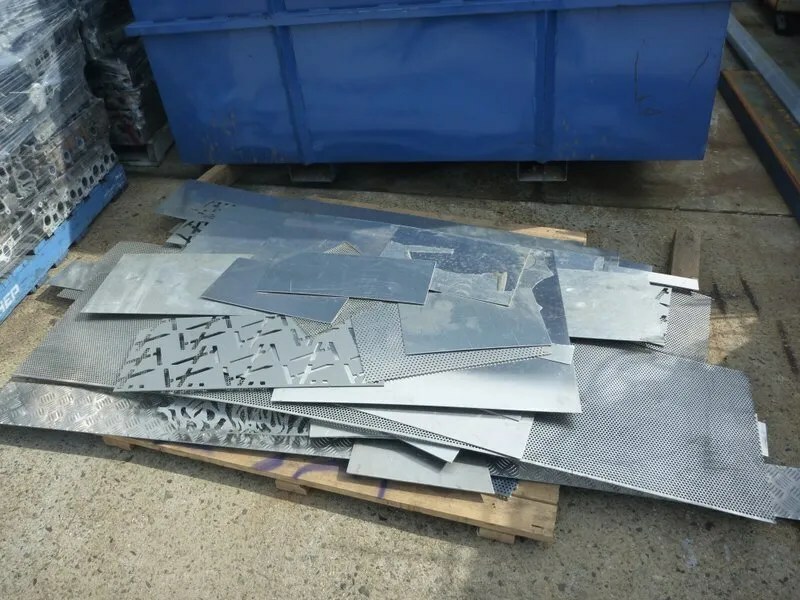 In that pile there’s everything from 3mm chequer plate to 1mm sheet – ideal for everything from gongs to metallophones and cymbals. There’s also sheet with all sorts of interesting perforation patterns that could be used for scraper instruments like guiros or even something like the old jug band washboard. On another day at Rondas you might find something altogether different: I’ve seen stainless steel pots, pans and lids; metal bowls of all kinds; brake discs and drums; sheet copper and brass; bronze castings; even ex-hospital stainless steel trays, bowls and containers. I had high hopes of a stainless steel hospital bed pan which I thought might sound like a bell, but disappointingly it just went “clunk” when struck. It sounded like … um … what it used to contain! More about selecting metal – hit it! Try all the beaters on each piece of metal, and try hitting it in different places. On the edge, on flat surfaces, towards the middle – you can’t always tell where the best sound will be. If the metal is textured or perforated then make sure you try scraping it too. You have to know where to hold ’em! For pipe, rods and tubes, hold them vertically between finger and thumb. Most likely the best place to hold it will be around 1/4 of the total length of the piece, as this is a “node”, a point where the pipe is not vibrating. Holding it here means your fingers won’t be damping the vibrations and it will ring out clearly but you may need to experiment with the exact position of hold for the clearest sound. For flat sheets of metal there are a few ways to try. First off, if it’s sheets of aluminium, copper, bronze or stainless steel, and it’s round, square or rectangular in shape and between 1 and 5mm in thickness – no problems: it WILL sound good! But different shapes and thicknesses give different sounds and it depends if you are after a cymbal sound, a gong sound or a melodic sound like a glockenspiel or other metallophone. It may take a little work to turn it into an instrument, of course, but that’s what hacksaws, jigsaws and angle grinders were invented for. 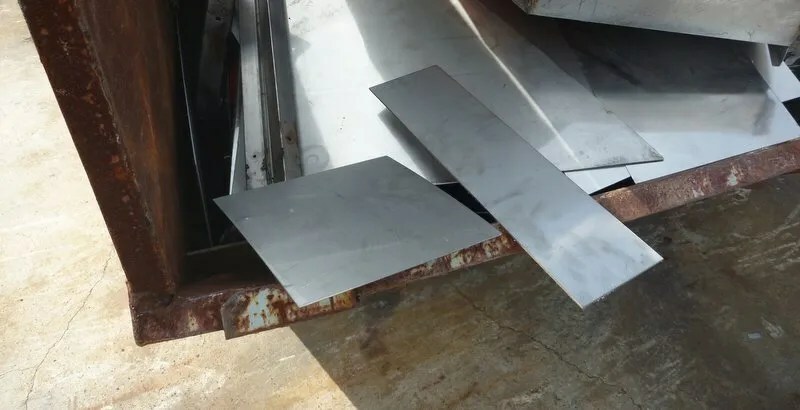 Smallish metal sheets can also be balanced on a finger tip at the centre of the sheet – this will give gong or cymbal sounds depending on the thickness and type of metal. For odd shaped castings it’s a matter of experimenting with different holds, and the less contact area of the hold the better. Again, try balancing it on a finger tip at around the central position, or dropping it and hitting it in mid-air. A while ago I was at Rondas, looking for something new to inspire me. 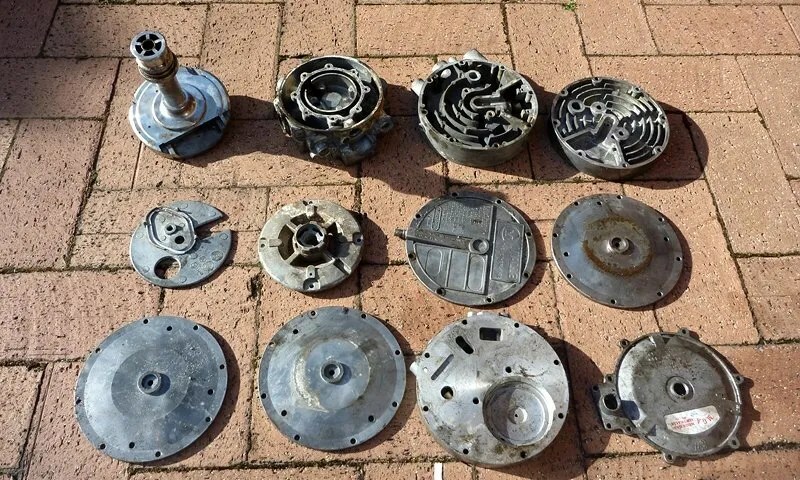 And in a bin I found just what I was looking for: circular aluminium castings, ideal for bell-like tones. I’m not sure what they were in their former life – I think some of them might be compressor components – but I balanced them on my finger-tip, hit them with a drumstick and they sounded great! Clear and quite high-pitched but with a variety of tones and pitches. I took them to be weighed – Rondas sell aluminium at $4 per kilogram – and handed over A$17.60 for the 12 castings. Excellent! To my workshop, James, and don’t spare the horses! In my next post I’ll walk you through the whole process of turning these scrap castings into a musical instrument, including how to build a very strong and stable PVC pipe frame. Have fun – and keep playing! This entry was posted in Early childhood education, Music play, Musical instrument making and tagged Child's Play Music, early childhood education, homemade musical instruments, music, Recycling, scrap metal, Upcycling by Alec @ Child's Play Music. Bookmark the permalink. Many thanks Alec for such an informative blog post! I totally agree that metal+imagination=music and would also like to add how much I enjoy adding water into this equation every now and then. Thanks, Juliet! Glad you liked it, and yes, metal is perfect for water play. My water play & music play post is my most popular post ever; I don’t know this one will reach the same number of people since it’s a bit more “techie”, but I hope it encourages people to give making instruments a go. Oh my goodness, Alec! You are amazing! I think it’s just incredible that you take absolute trash and turn it into these gorgeous instruments! That is a gift!! Thanks so much for sharing on my page today! Thanks, Jackie, and thanks for the opportunity to share it with your Facebook fans at Happy Hooligans.